Installation view of Aquatopia at CFCCA, 2018. Image courtesy CFCCA, photography by Michael Pollard. Whether it’s news like Cape Town nearly running out of water, or campaigns such as ‘Plastic Free July’ highlighting ocean pollution, it seems like humanity’s relationship with one of our most vital resources is at the forefront of the thoughts of many. And the Centre For Chinese Contemporary Art is no exception. Aquatopia features the work of six artists exploring water and water scarcity, forming part of the CFCCA’s ‘Season for Change’, which presents exhibitions to provoke discussions about environmental issues facing the planet. One particularly discursive piece is Kingsley Ng’s ‘Horizon’ (2014). Ng, whose previous works have included transforming a bus into a camera obscura (’25 Minutes Older’ (2013)) and uniting physical objects of the Hong Kong district of Sheng Wan with pieces from the Asia Art Archive (‘Life Archive’ (2013)), has described this piece as ‘urban acupuncture.’ Like the therapeutic treatment, ‘Horizon’ emphasises connections. The piece invites viewers to take water from an interconnected line of bottles and create a horizon. As one bottle affects others, it evokes the knock-on impact of water depletion on seemingly disparate locations, while fostering connections between participants as they navigate creating a horizon and reflecting on what it means to construct, take and rebalance resources. Connectedness is also foregrounded in the water purification system and sculpture by Lucy + Jorge Orta, ‘Portable Water Fountain’ (2005). With a metal fountain structurally reminiscent of the ceaseless cycle of a hamster wheel, dry water spouts are accompanied by an unfilled bucket and deflated life jacket – like those seen on rescued migrants from perilous sea crossings – balanced precariously on the wheel’s edge. 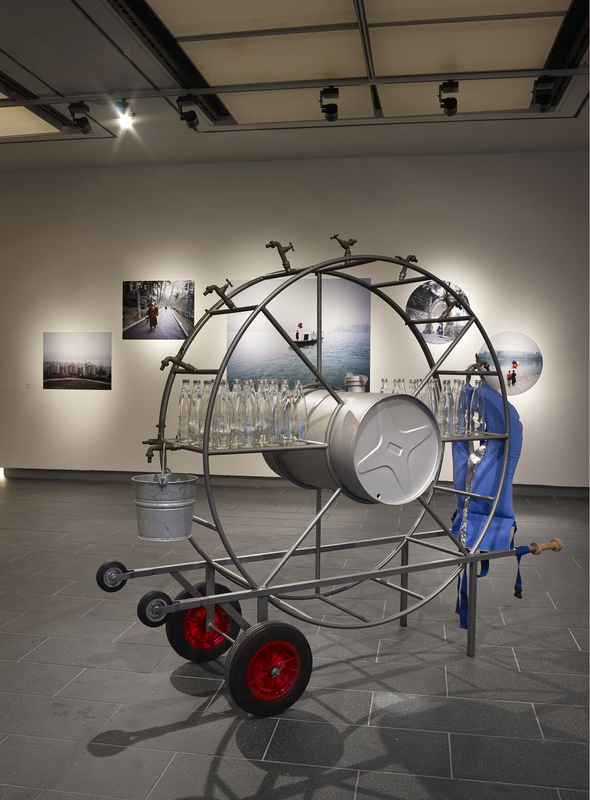 Through this placement, the duo’s piece helps remind viewers that it is those inhabiting peripheries that are commonly effected by water scarcity, while the wheel’s centre is occupied by artist-branded water bottles suggesting the easily accessed, marketed and filtered water familiar in affluent global centres. Providing somewhat of a thematic mirror to ‘Portable Water Fountain’ is the ironic commentary on urban development, ‘Green Island’ (2016) by Joao Vasco Paiva, which constructs a barren, miniature sand and concrete island. In contrast, a pale ghost-like figure haunts the remains of a city flooded by the Gorges Dam Project in Chen Qiulin’s striking photography ‘The Empty City’ (2012), while a parade of mourners mark rising water levels in Liu Shiyuan’s film ‘The Edge of Vision, or the Edge of the Earth’ (2013). Qiulin and Shiyuan’s photographic and filmic pieces show humans impacted by water change, literally placing them front and centre within the exhibition, foregrounding potential devastation of environmental issues. Photography and film are particularly appropriate for evoking such devastation, as it is through such mediums that many observe the real world impacts of rising water levels, pollution and scarcity through second-hand media sources. A final note should be given to Liu Yujia’s ‘Wave’ (2017), which offers a meditative video installation on the undulation of tides, providing a respite to observe water’s beauty and reflect on the complex relationships between humans and water explored in Aquatopia. Returning to the analogy of acupuncture, Aquatopia doesn’t only explore the connectedness of humans with water, but strikes a nerve with one of the key issues facing the planet, and potentially every viewer of the exhibition. That is not to say that that the tone of the exhibition is purely pessimistic or optimistic for the future of this resource, but rather that the works serve to open up discussions about how we see our current relationship with water and where it may lead. 6 July – 7 October 2018.